There is a childlike line of enquiry to this question yet the question itself is as old as the hills and the journey he takes in revealing the geometry dominant in all forms of nature is a journey not dissimilar of Kepler’s in the 1600s. But from the contemporary viewpoint, Stewart takes in studies proven and disregarded over the last few hundred years. He just keeps asking questions, and that just keeps you reading. This book isn’t a case of taking one part of nature and examining closely, Stewart is reviewing all examples in nature simultaneously. Yes, Fibonacci and its associations to plant numerology is addressed (that will please many no doubt), yet it is not laboured on. Laid out in easy to read chapters, the concepts discussed here are expansive and philosophical. In a discussion on Pattern, he poses the question as to whether the patterns are really there or not. Is it just our perception? yet at the same time showing us biological studies into Turing’s theory of chemical reactions through a substrate. His look into ‘order’ and, at this point a gentle intro to ‘chaos’ is equally mind expanding. Stating that they are merely concepts of our understanding and language. Order is nearly always present, it is only the vast and varied circumstances of it that change the outcome. Thrillingly, this became the underlying behaviour of that which determines spots from stripes in animal markings. How they are made in the same way yet one process became unstable and turned into spots. Make no mistake – this is a science book. Arranged around stories that demonstrate different governing rules of physics or maths in nature. Frustratingly it observes evidence in such a way as to draw conclusions in natural laws then goes on to contradict them also! Frustrating as this may be, I do have a particular love of nature breaking its own rules. He points out; and this seems an important note; on how mathematicians will always seek out the perfect. And nature is never quite perfect. Nature displays and follows its own laws yet it will be the mathematician who exacts everything to the decimal point. The opening part of the book looks at the principles at work in nature. And the middle section delves into maths concepts. Looking at types of symmetry, scale and time. This is maths in nature from a visual perspective , but also about functionality. How maths governs behaviours in physics as well as in biological growth and form. About mid way through the book Stewart pauses, to give us all a chance to catch up. (Phew!). He very wisely observes that the talk of beauty of mathemetics may seem alien to the everyday observer as there is nothing particularly beautiful about ‘arithmetic’. “Those symbols on the page come no closer to the true beauty of the subject than the staves and sixteenth notes of musical notation come to a complete Beethoven symphony. The logical side of beauty in maths may be only fully appreciated by those of higher study . Mathematical proofs can be their own symphonies to someone who understands the concepts. 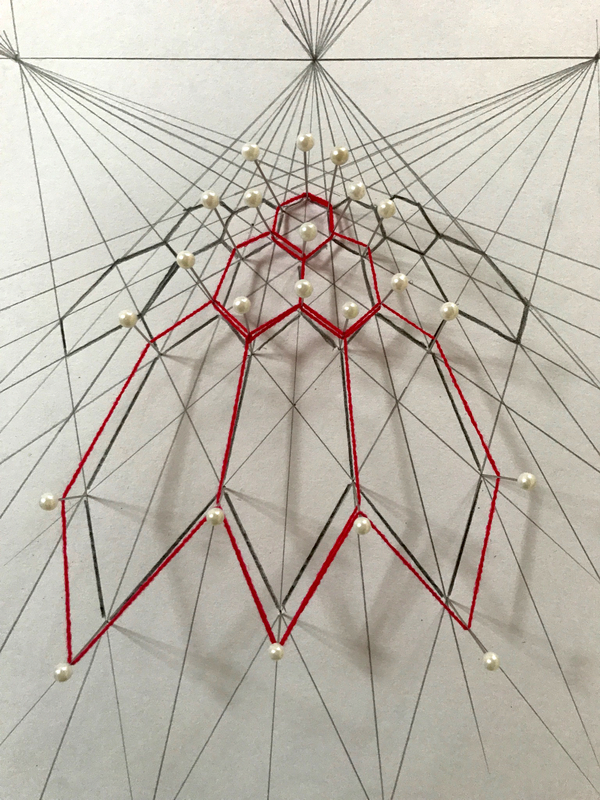 Yet the visual beauty of maths is what draws us all in. And has more direct communication to every observer. “So it seems to me that the mathematical inclinations of the human mind are evolutionary responses to genuine patterns in the surrounding universe”. So…. by the end of the middle section I’m feeling confident I have a grasp on this maths in nature thing. The third and final part of the book asks us to take a leap of faith. Having set up our understanding of the symmetry and laws that govern nature, he properly introduces choas and complexity. The rollercoaster journey of the mind really begins. The physics of phase transitions, attractors, hyperbolic manifolds, fractals and symmetry breaking lead to an oh so very specific type of chaos that we have yet to fully predict. (I’ll never think of aeroplane turbulence the same again!). We leave the very safe world of visual patterns that kept me comforted and reassured and enter into a philosophical journey that as a species we have been on for hundreds of years. Ian Stewart is a well respected research scientist in pattern formation and chaos. He is a Fellow of the Royal Society and his list of medals and awards reads as an encyclopedia of the science world. I feel safe in his knowledge. He very eloquently positions us on the road to understanding the physics of the universe just as those have attempted to do before us. Our quest for knowledge of the universe is the same as theirs, its just as tech advances so do our discoveries and conclusions. But more questions appear ahead of us. And I ask myself … Do I cling to the visual laws of nature because it is safe and provides us with some answers? I feel I have journeyed to outer galaxies safe in the bubble of Stewart’s knowledge and glimpsed worlds which may yet exist or may never have existed. Talk of time travel and wormholes seem quite acceptable all of a sudden. And I really bring myself to perceive the shape of the universe as a Torus. And then like a true storyteller, in the turn of a page he brings us back to the infinitesimally small snowflake where we started. And I understand. I really do. I don’t know how to explain it to you without copying everything he said, but I do understand. The snowflake is of course a snowflake shape but at the same time so complex and chaotic and symmetical all at once. It encompasses all the bifurcation and catastrophe and complex worlds he discussed, yet sits melting in my palm before I have a chance to fully appreciate all the circumstances which led it to be there. Oh snowflake, stay a while. then, like a splash in a puddle, it was gone. 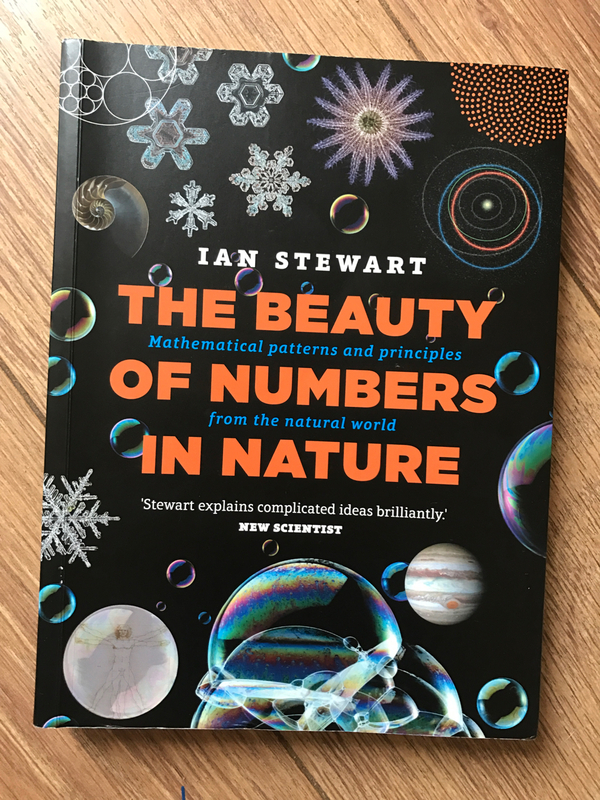 The Beauty of Numbers in Nature – Mathematical principles from the Natural World by Ian Stewart. published by Quarto.